Thomas E. Reck, a resident of Winston, New Mexico and formerly a resident of Truth or Consequences, New Mexico, passed away June 13, 2018. Tom was born in Oak Park, Illinois in November 23, 1932. He served in the U. S Army during the Korean Conflict. He owned and operated ABC Nursery for many years before retiring eventually settling in Winston with his beloved late wife, Willyne “Willy” Reck. He was a member of the Winston Chloride Volunteer Fire Department, enjoyed the fellowship of the Winston Country Church congregation, and the friendship of the Winston, Chloride, Chiz & Dusty (WCC&D) Community. Tom is survived by his children, Kurt R. Reck of Truth or Consequences, NM; Kim E. Reck Butz (Ross W. Butz) of Winston, NM; his grandchild Cassandra L. Flores of Arizona and great grandchildren Kelsey, Aemelio and Blas; grandchild Lieren E. Barkenhagen (John P. Barkenhagen) of Arizona and great grandchild Emily; grandchild Sean R. Hackbarth of Rhode Island and great grandchild Iris; and step-grandson Thomas J. Butz (Holly White) of Rhode Island and step-great grandchildren Haley and Alexandra. In lieu of flowers, the family requests that donations be made to the Winston Country Church, P.O. 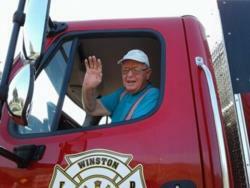 Box 225, Winston, NM 87943; Winston Chloride Volunteer Fire Department, P.O. Box 104, Winston, NM 87943 and/or the WCC&D Community Association, P.O. Box 181, Winston, NM 89743. Cremation has taken place and no services will be held per Tom’s wishes.